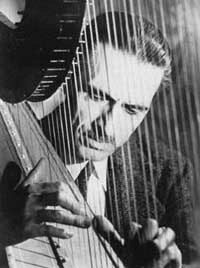 The American Harp Society Marcel Grandjany Centennial Fund was established in 1991 to underwrite the centennial celebration of the birth of Marcel Grandjany. Contributions to this Fund have made possible the production of videotapes derived from home videos made in 1972 and an audio cassette first released in celebration of the Tenth Anniversary of the AHS. A compact disk has been remastered from the audio cassette released in 1972 which includes the program personally selected by Mr. Grandjany and additional works. Marcel Grandjany (1891-1975) began the study of the harp at the age of eight with Henriette Renié. He was admitted to the Paris Conservatoire at age eleven where he also studied with Hasselmans, winning the coveted Premier Prix at age thirteen. At seventeen he made his debut with the Concerts Lamoreux Orchestra, and gave his first solo recital, winning immediate acclaim. He appeared with Maurice Ravel in Paris in 1913. His London debut was in 1922 and his New York debut in 1924. He appeared as soloist with major orchestras under the direction of Pierné, Cortot, Damrosch, Koussevitsky, Szell, Reiner and Golschmann among others. From 1921 to 1926 Mr. Grandjany headed the harp department of the Fontainebleau Summer School. He moved to the United States in 1926 and was appointed head of the harp department at the Juilliard School of Music in 1938 where he taught until his death in 1975. He also taught at the Manhattan School of Music from 1956-1967. At the First International Harp Contest in Israel in 1959, Pierre Jamet of France proposed the formation of an international association of harpists. Grandjany undertook to see what he could do in the U. S. and chaired a committee of leading harpists. The Founding Committee met for the first time on December 3, 1962 in Mr. Grandjany’s apartment. Over the years, he was a member of the Board of Directors, Regional Director, Chapter Chairman and President of the New York Chapter. He generously performed at AHS conferences; in 1964 at the first conference and in 1967, a solo recital which was his last public performance. He supported the educational goals of the Society vigorously. He delighted in the American Harp Society’s growth and sense of community it gives to all harpists. Perhaps the American Harp Society will prove to be his most lasting memorial.